We’re thrilled! News of CID’s benefits and advantages is spreading, friends! These opportunities in October and November come with promise. At the Wisconsin State Bar Solo & Small Firm Conference we focus on text-only formats. Many documents in the legal profession are limited to text (no pictures, color, special formatting, etc.) so this is a targeted approach. In November we will premier a talk on PowerPoint (PPT) for those who teach adults. 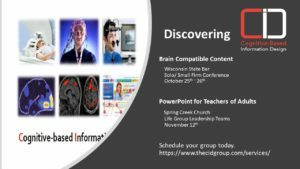 We’ll include a few general tips but most of the half-hour talk will focus on how to utilize CID constructs in PowerPoint presentations for adult learners. Hopefully we’ll come away with a few pictures of these sessions in action, along with quotes and observations. If you’d like to schedule an introductory or training session, click on the Services tab at right and contact us, or send us an email to start the conversation.